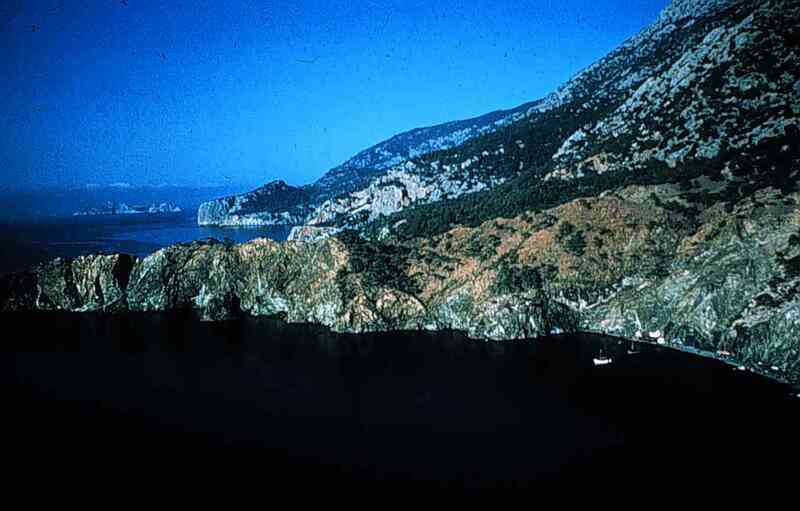 Cape Gelidonya, sometimes known also as Khelidonya or Silidonya Burnu, is the Chelidonian promontory of Pliny (Natural History 5.27.97) in Lycia. The cape marks the western extremity of the Bay of Antalya. 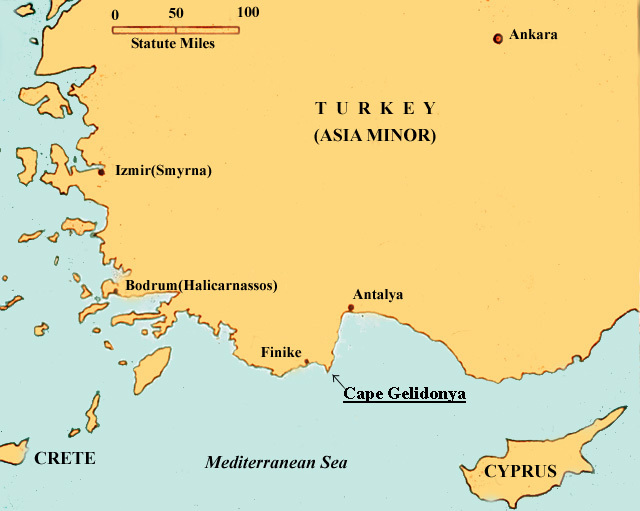 Running south from the cape is a string of five small islands, the Chelidoniae of antiquity, called Celidoni by Italian sailors, and later, Selidonlar by the Turks, but today known simply as Besadalar (Five Islands). Strabo (14.2.1 and 14.3.8) noted only three of them and Pliny (Natural History 5.35.1 31 ) only four. In about 1200 BC, a merchant vessel apparently ripped its bottom open on a pinnacle of rock that nears the surface of the sea just off the northeast side of Devecitasi Abasi, the largest of the islands (36° 11’40” N, 30° 24’Z7″ E). Spilling artifacts in a line as she sank, the ship eventually settled with her stern resting on a large boulder 50 meters or so away to the north; her bow landed on a flat sea-floor of rock. At some point during the hull’s disintegration, the stern slipped off the boulder into a natural gully formed by the boulder and the base of the island. In 1954, Kemal Aras, a sponge diver from Bodrum, stumbled on the wreck’s main concentration of cargo, between 26 and 28 meters deep. Four years later, he described it to American journalist and amateur archaeologist Peter Throckmorton, who was cataloguing ancient wrecks along the southwest Turkish coast. Throckmorton was able to locate the site in 1959 and, recognizing its great age, asked the University Museum of the University of Pennsylvania if it would organize its excavation. The subsequent excavation of this Late Bronze Age site, between the middle of June and the middle of September 1960, was the first shipwreck excavation carried to completion on the sea bed, the first directed by a diving archaeologist, and the first conducted following the standards of terrestrial excavation. Visits to the site in the late 1980s by a team from the Institute of Nautical Archaeology (INA) at Texas A&M University showed, after more artifacts were recovered, how the ship had sunk. The sinking has been dated to the late thirteenth century BC by two nearly intact Mycenaean IIIB stirrup jars discovered on these visits and by a radiocarbon date of 1200 BC +/-50 years from brushwood on the wreck. Because of a lack of protective sediment, most of the ship’s hull had been devoured by marine borers, especially teredos. We know, however, that its planks were held together with pegged mortise-and-tenon joints, the method of ship construction used in Greek and Roman times. Furthermore, its brushwood dunnage gave for the first time meaning to the brushwood Odysseus placed in a vessel he had built (Odyssey. 5.257).The distribution of cargo originally led to a published estimate of not much longer than 10 meters for the hull, but recent discoveries suggest that this estimate was low. 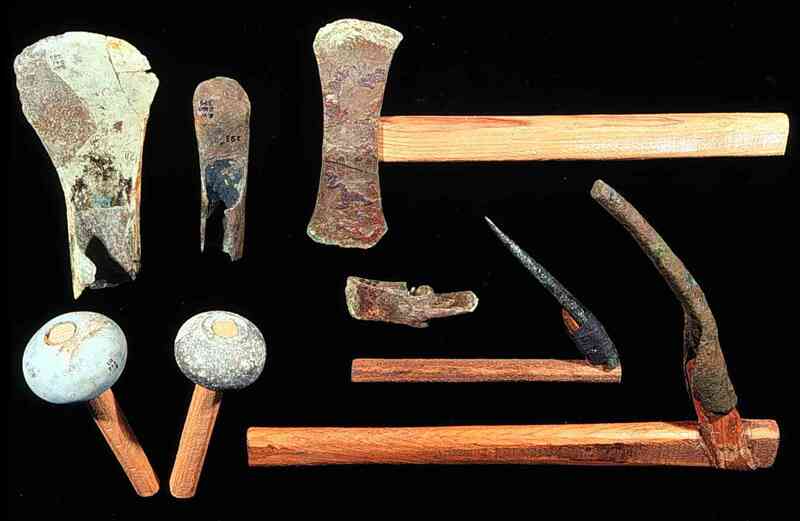 Scrap bronze tools with modern handles and two stone hammers (Photo: INA, Slide # CG590). The bulk of the cargo consisted of the ingredients for making bronze implements, including both scrap bronze tools from Cyprus, intended to be recycled, and ingots of both copper and tin, meant to be mixed to form new bronze. The scrap, at least partly carried in wicker baskets, included broken plowshares, axes, adzes, chisels, pruning hooks, a spade, knives, and casting waste. The copper, mined on Cyprus, was shipped as 34 flat, four-handled ingots, weighing on average 25 kilograms apiece, of the type once thought to imitate dried ox hides in a pre-monetary form of currency; discoid “bun ingots,” averaging only about 3 kilograms each; and fragments chiseled from each type. The tin ingots were too badly corroded to reveal their original shapes, but seabed evidence suggests that at least one was a rectangular bar. In addition, there were 18 much smaller, flat, ovoid ingots, at least one of them bronze, that seem to have been cast in multiples of 0.5 kilograms. Syrian cylinder seal with the long dead merchant’s “signature” and its clay impression. (Photo: INA, Slide # CG624). The discovery on the wreck of a bronze swage, stone hammerheads of the kinds sometimes used for metalworking, many stone polishers and a whetstone, and a large, flat close-grained stone that could have served as an anvil suggest that a tinker may have been on the voyage. The wreck’s importance derives from the historical conclusions drawn from it. At the time of its excavation, it was generally accepted that Mycenaean Greeks had a monopoly on maritime commerce in the eastern Mediterranean during the latter part of the Late Bronze Age, and that Phoenician sailors did not begin their great tradition of seafaring until the following Iron Age. Indeed, the main reason that Homer’s Odyssey has been commonly dated to the eighth century BC by modern classicists is his frequent mention of Phoenician sailors and bronze-smiths. The Cape Gelidonya shipwreck suggests new possibilities. The southeast end of the wreck, most probably its stern, held what may be considered personal possessions of crew and/or passengers, as opposed to the mostly Cypriot cargo and the shipboard mixture of Mycenaean, Cypriot, and Syrian pottery. 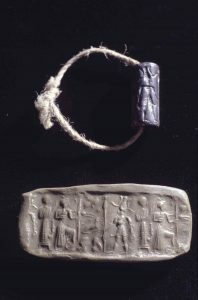 These possessions included four scarabs and a scarab-shaped plaque, an oil lamp, stone mortars, more than 60 stone pan-balance weights (including Egyptian qedets, and Syrian nesefs and shekels), and a merchant’s cylinder seal, all apparently of Syrian, or Canaanite, origin; a razor is of Egyptian rather than Mycenaean type. The expedition camp in 1960 on the narrow beach (to the right) (Photo: INA, Slide # CG21). The conclusion was that the ship was probably Canaanite, or early Phoenician (the Canaanites being simply Bronze Age Phoenicians), although because so many Near Eastern artifacts were found on Cyprus from the same period, there was the possibility that the ship was Cypriot. Library research revealed that, with a single exception, contemporary Egyptian artists associated the trade in four-handled copper ingots, and tin ingots, solely with Syrian merchants (the only known mold for casting four-handled copper ingots was found after the Cape Gelidonya excavation, in a palace at Ras-ibn-Hani, the port of Ras Shamra/Ugarit, the greatest of Late Bronze Age Syrian port cities). Furthermore, the only foreign merchant ships depicted in Egyptian art of the time are Syrian. All this suggested that Homer’s Phoenicians are not anachronistic in the Late Bronze Age of the Trojan War. The discovery in 1994 of the Cape Gelidonya ship’s Syro-Canaanite or Cypriot stone anchor bolstered my contention that the ship was of Near Eastern origin.